Figure 4.18: Users can specify Landscape [Default] or Portrait (-P) orientation. -P selects Portrait plotting mode4.8. In general, a plot has an x-axis increasing from left to right and a y-axis increasing from bottom to top. 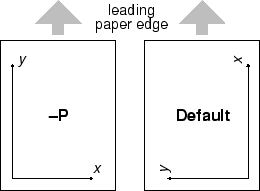 If the paper is turned so that the long dimension of the paper is parallel to the x-axis then the plot is said to have Landscape orientation. If the long dimension of the paper parallels the y-axis the orientation is called Portrait (think of taking pictures with a camera and these words make sense). The default Landscape orientation is obtained by translating the origin in the x-direction (by the width of the chosen paper PAPER_MEDIA) and then rotating the coordinate system counterclockwise by 90 . By default the PAPER_MEDIA is set to Letter (or A4 if SI is chosen); this value must be changed when using different media, such as 11" x 17" or large format plotters (Figure 4.18).